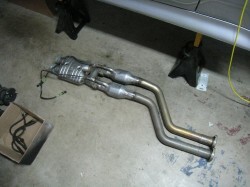 I finally finished up the exhaust system on my M Coupe, from head to tail(pipe.) 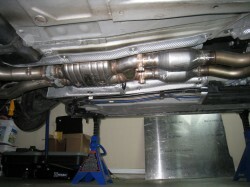 This project started with ditching the Dinan “potato-shooter” mufflers for a set of quad-tip Supersprints. The sound didn’t change much, but the looks were far better. The Supersprint setup also allowed for the installation of a Rogue Engineering dual-ear E36 finned differential cover in conjunction with Randy Forbes’ floor reinforcement kit. So now to move further up the exhaust pipe and take care of the headers. 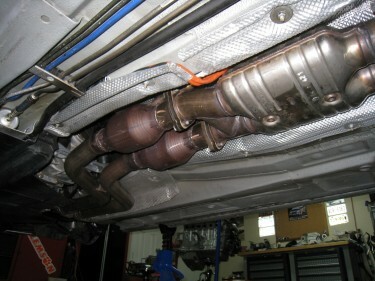 After much reading on the E46 forums, it became pretty clear that the S54 responds very well to headers. 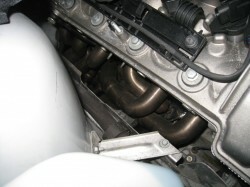 Like most USDM-spec cars, the S54 came choked from the factory with catalytic convertors built into the headers. The rest of the world (ROW) got much better flowing headers and catalytic convertors downstream. 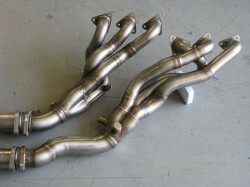 USDM S54 Headers with integrated cats. So I had a few options to bring out the performance in the S54 that our European brothers were already enjoying. One was to simply install European headers, a proven option. The drawback to this is that you either need the European secondary pipe or you need to weld in a EGTbung (good luck finding that) into the headers. Still a pretty simple solution, and OEM quality. I ended up picking up a UK (right hand drive) set of headers. 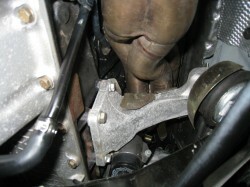 Virtually identical to LHD headers, other than a small indentation in one of the runners to clear the steering shaft. But what I really wanted was the Supersprint Stepped V2 Headers, which were proven to maintain or increase torque across the revs and add plenty of top-end. 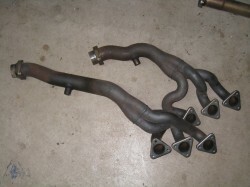 Their were a couple of issues; first of all I couldn’t find any E36/7/8 owners who had installed these headers, even Supersprint NA couldn’t confirm they would fit. The other issue; they, like all Supersprint products, are extremely expensive. 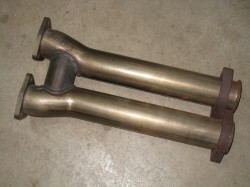 Fortunately I got lucky and ran across a set of lightly used Stepped V2 headers for sale on the M3 forums, where they usually don’t last long. I took the plunge, knowing that if they didn’t fit, I could always sell them for what I paid and go with the Euro headers. Note: There are quite a few other options for S54 headers out there, including numerous Supersprint knock-offs from China, which can be found for very cheap all over eBay. I didn’t consider this an option, you definitely get what you pay for.. I couldn’t contemplate putting some Chinese junk on such a rare and special car. 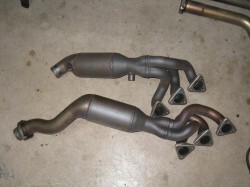 My luck continued and the Supersprint Stepped V2 headers fit in the M Coupe like a glove. Unlike some of the issues folks with eBay headers have had, there were no clearance problems. 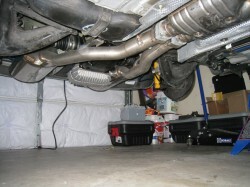 So there you have it, Supersprint V2s will fit just fine in an S54-powered M Coupe or Roadster. 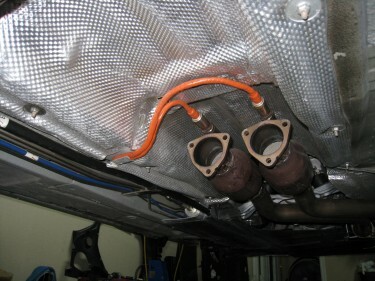 Prior to installation I installed 16 new header studs, new gaskets, and 16 new copper plated nuts. I considered having the headers ceramic coated, but opted not to. I figured that the factory designed a certain amount of thermal lose at the headers. Probably wouldn’t make too much of a difference either way. I’ve had bad luck with several different coating companies, neither holding up like they should. 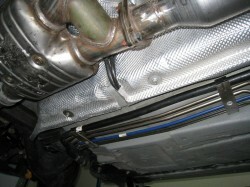 With the Supersprint headers you get provisions for fourO2 sensors as well as the EGT probe. 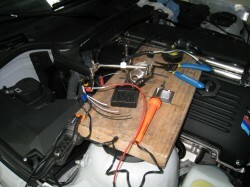 The secondary O2 sensors are meant to be run after catalytic convertors, as a check on the catalyst. If you just screw the sensors into the header, you will get aCEL. You have some options: run software to eliminate the check on the O2 sensors, get O2simulators, or place cats in the secondary pipe and move the O2 sensors after them. The first two options aren’t exactly legal if you live in a smog state/county. Midpipe with cats welded in. Since I never no where I’ll end up, and I wanted to maintain a somewhat OE setup, I went with the third option. Supersprint sells a secondary pipe (aka midpipe) with cats, but it’s ridiculously expensive for what it is. There are a couple other vendors that offer similar setups for the E46, but nothing specific to the Z3 chassis. I decided to just purchase the cats separately and weld them into the midpipe myself. I went with 200cpi cats, in between your average 400cpi “high flows” and your race-ish 100cpi. I placed the cats in the same location the factory used in the Euro market, at the end of the midpipe, just prior to the H-pipe. With the cats moved all the way back in the midpipe, the O2sensors also had to be move back. 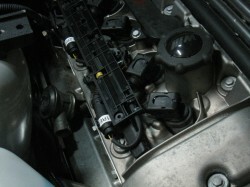 The O2 sensor wiring is run in a loom underneath the plastic engine cover on top of the valve cover. Unwinding this will give you some more slack, but not enough to where I needed to go. I could have simply cut the wires and lengthened them, but I wanted to keep it a little more modular and OE-like. I needed to make an extension cable. Unfortunately you can’t simply purchase the Bosch brand plugs, at least I couldn’t find them anywhere. 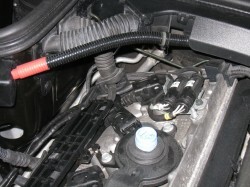 BMW also used two different style plugs for the four O2 sensors in this car, but even more styles across their range. They mostly look the same from the outside, but have different detents to keep you from plugging in the wrong ends. Fortunately they sometimes used the female end for the sensor and sometimes the male end. This meant if I could find the right plug shapes, I could simply buy used O2sensors for their plugs. 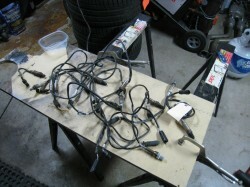 After a lot of trial and error on eBay, I was able to put together the right combination to make two extension cables. I soldiered and heat shrinked all the splices, covering the ends close to the exhaust with high-temp silicone/glass sheathing and high-temp split loom the rest of the way. With the extensions complete, I ran the wires out of the engine cover just the same as factory and then behind the head, over the bell-housing, and down the side of the transmission tunnel. I stuffed the wires behind the aluminum heat shield down to where the sensor bungs were, which I had welded on top of the rear of the cats. The heat shielding was already cut and formed to route wires to the O2 sensors in European cars, so I was able to utilize the same routing in my setup, very convenient and tidy. 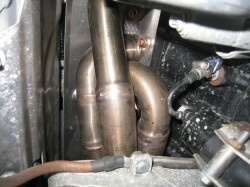 Behind the midpipe on the US cars you find a separate length of pipe containing an H crossover, aka “balance pipe”, used to equalize exhaust pulses between the two cylinder banks. Really that’s a bit of a misnomer, as it’s an inline engine, but with two separate headers with their own individual exhaust routing. 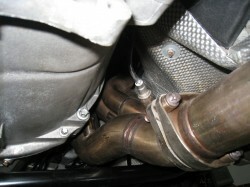 The ROW didn’t have this simple H-pipe, but an H-pipe with an integrated resonator (referred to as a “center silencer” by BMW.) Finding the part number (18107831421) for this silencer is easy enough, but good luck ordering one. Several US parts departments turned me down. Lucky me, I had a friend stationed in Germany who was willing to go down to the local dealership and order one for me. The benefit of this silencer is it reduces, though not totally eliminates, the infamous S54 rasp. If you’ve never heard an S54 at full trot, especially one with an aftermarket exhaust and headers, it’s a bit hard to describe this rasp. The engine produces a very metallic, mechanical wail. Imagine a 3200cc 6 cylinder chainsaw at 8,000 rpm. Some like it, many despise it, I just wanted a touch of it to remind me what I was driving. This Euro resonator has really met my expectations. The combined effects of the Supersprint stepped headers, high-flow cats, Euro resonator, and Supersprint exhaust has really resulted in a wonderful sound. UPDATE: I had an issue with the O2 sensors loosening up and a little burning of the leads on the exhaust pipe, here’s the simple fix. I fixed the loose O2 sensors after removing the center silencer (resonator.) 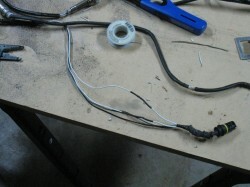 While I was in there I noticed a little chaffing on the wires, so I added some high-temp silicone tape.